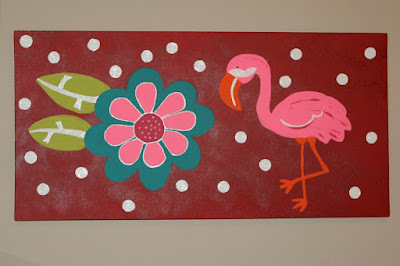 For Made it Monday this week I am showing off a painting that I did for my niece's room. Flamingo's are the theme of her room. I think it turned out pretty well considering that I am not an expert in flamingos. The canvas was from Hobby Lobby. The paints were just your cheap acrylic paint and the white highlights were puff paint for t-shirts which gave it a little dimension. What have you been up to lately? Join us for Made it Monday!